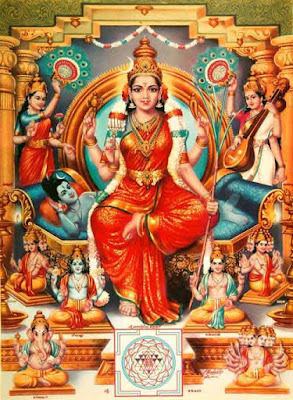 Kadi Vidya is a prayer or mantra chanted during puja and meditation of Goddess Lalita Tripurasundari. The mantra or chant starts with the letter ka. Kadi Vidya has 15 syllables and is therefore a Panchadasakshari Mantra. It is believed that Lord Dakshinamurti created the Kadi Vidya. The chanting of the mantra will help in attaining self-realization as per Tantra Shastra. The mantra has three parts: - Vaghava Kuta, Kamaraja Kuta and Shakti Kuta.